Online tickets sales are closed. Tickets will be available at the door beginning at 6:30pm on Friday. 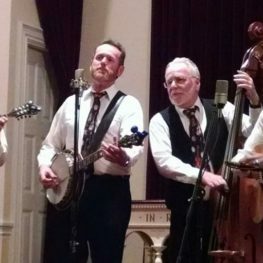 Traditional Bluegrass Music – The Best in Maine! share lead and harmony singing. Their repertoire features tight harmonies and smooth solos. KVB performs family oriented shows have a fresh, personal, approach and an exciting format. Jeff Folger is a native of Sidney, Maine. A towering lead and tenor harmony singer, Jeff plays the 5-string banjo in a traditional, hard driving style. The classic sounds of Ralph Stanley, Earl Scruggs and J.D. Crowe have been a major part of his musical influence. Jeff has been performing since 1993 and has been with the Katahdin Valley Boys since 1998 as a founding member. Mandolin, sings lead and harmony vocals, and is a talented guitar player. Dan draws from a wealth of experience having played with several roots and bluegrass ensembles performing original material as well as cover tunes. The Katahdin Valley Boys are proud to add Dan to the band in 2016. Ken Brooks calls Athens, Maine home. Ken was honored by the Maine County Music Association as an inductee into the “Country Music Hall of Fame” in 2012! His superb rhythm and lead Guitar picking along with lead and harmony vocals enhance the band’s all around sound. Ken brings a wealth of experience and vast repertoire to the band. Performing since 1965, Ken has played with several popular bluegrass bands. Ken has an extensive discography having recorded as a solo and ensemble artist. The Katahdin Valley Boys are proud to incorporate Ken’s vocal excellence and solid guitar work into the band. show. Originally from Ashland, Massachusetts, Steve lives on the Pemaquid Penninsula in Round Pond, Maine. At the invitation of a friend to join him at a festival in New York State, Steve caught the Bluegrass bug in 1978 and began playing Bluegrass Bass in 1980. An accomplished Bass player and recording artist, he has performed with several well known Bluegrass acts and at numerous Bluegrass Festivals throughout the Northeast.